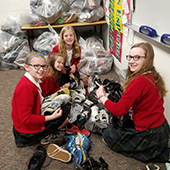 Community service is an important part of the Catholic faith tradition and an important part of an STM Catholic education. The School encourages students to put their faith into action in accord with Catholic social teaching – respecting the sanctity of life and dignity of others, responding to the call to participate in the family and community, placing priority on the needs of the poor and the most vulnerable in society, building unity among people, and caring for God’s creation. Betas organized the Fall Food Drive and contributions were given to Saint Thomas More’s Feeding Our Friends program. Betas organized a “Winter Warmth Drive” for our brothers/sisters at Christ in the City. Thank you 6 grade students for sharing your time talent and treasure with the homeless in Denver! Our friends on the street were thrilled to receive your generous gifts. It was great fun watching them look and read your sacks before choosing the best one to keep. You are the best! We are a stewardship community. There are opportunities throughout the school year for our Middle School students to take part in community service in school. We also require our students to help those in need outside of STM Catholic community by doing service for others. The Children’s Charity Account has been set up to help educate the children and the youth at St. Thomas More Parish about the gifts of Stewardship. When recognizing that all of our gifts truly belong to God, we can help the children and youth see the entire process of stewardship through time, talent and treasure. This account serves to encourage the young people to tithe through weekly Sunday envelopes. STM Catholic also donates to this account through a tithe made from the annual fund-raising event, which is for their specific use. The money received is strictly used for charity. Each Faith and Academic Formation branch will receive a budget for the year, for the Children’s Charity Account. The children and youth are encouraged to learn about different service organizations that might need financial assistance. Requests are then made by the children and youth to offer their treasure to these organizations.